These comments are from David Baker, Mayor of Kenmore, but they apply just as well to Shoreline and Lake Forest Park. In these last few days, Public Works been running five trucks, 24 hours a day, and have plowed/sanded all Priority 1 streets multiple times. This schedule will continue into the next few days as snow continues to fall. They also made it to many Priority 2 and 3 roads and will continue to plow as many streets as possible. We are getting a lot of requests for roads to be sanded. Our crew continues to sand, but will stop doing so when it starts snowing again (materials and effort are wasted once snow accumulates on top). Sanding can resume when the roads are plowed and new snow accumulation is not imminent. Sometimes we get asked why some residential streets get plowed sooner than others. 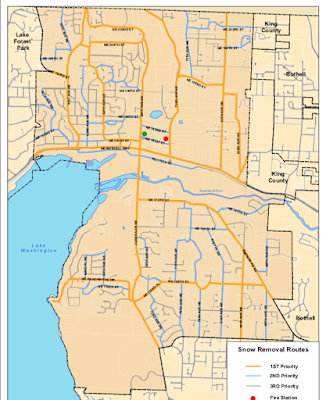 The answer is that we do follow the priority route map, but some residential streets are too steep and slippery even for our snow plow trucks. Quite often a truck will be plowing a residential street and will be pulled away due to unexpected incidents elsewhere or changing weather conditions. So, while we have all plows out working as fast as they can around the clock, their overall progress and what residential streets get plowed and when, is not as predictable as we would like. 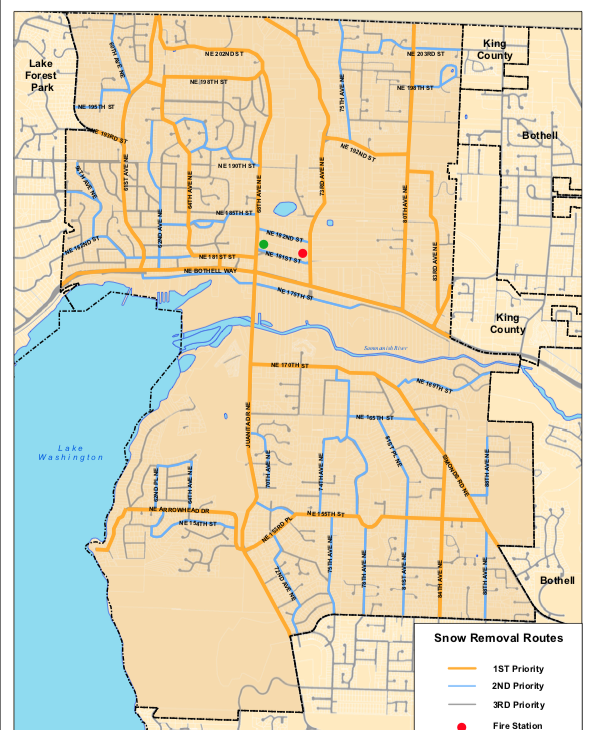 (LFP is responsible for Bothell Way and Ballinger Way through LFP).